Visit Baltimore research is showing that 30% of Baltimore area suburbanites are decreasing their trips into Baltimore City. Amazon and the rainiest year on record are not helping. Baltimore retailers need you to come. There a lot great things about Baltimore this holiday season and I will just point to a few. This article focuses a bit on downtown, but don’t miss out on unique neighborhood shopping, eating, and drinking experiences all over town. The Light City Festival is great, but the winter holiday shows us maybe we should be Light City all year round. Has anybody thought of making the wheel permanent? It is a great light display all by itself. What about making sure the Bromo Seltzer Tower and other select Baltimore landmarks always shine brightly in the night. Lights make the city a festive place, lets do even more of it. The Christmas Market has Germanic food, brews, and wine to go along with about 50 seasonal retailers. You can knock out your shopping while raising your stein of beer from the Hofbrau Munchen Brewery. Shop at the places that are in bricks and mortar stores and are here year round. Reward the retailers that do fantastic holiday displays in their windows. Cafe Poupon should do clinics on window displays. Stop here on Charles Street for something sweet, a sandwich, or a coffee. Consider a night or two in a Baltimore hotel or Air BnB as a gift. Being a home town tourist in Baltimore comes with no airline delays or lost luggage. Check out Made in Baltimore, which showcases Baltimore makers. MIB now has a pop up shop at 20 W. North Avenue. Down the street is Joe Squared, where you can always have a delicious risotto or pizza pie. I have a bit of a bone to pick with the Inner Harbor Barnes & Noble, which barely looked open last Saturday as we made our way in the rain. The B&N window displays could take a lesson from the Cafe Poupon. However, after arriving, I am always reminded what a treasure this store is. It is housed in the iconic Baltimore Power Plant building and has so many books that can teach us so much about life, places, people, fantasy, sports, travel, architecture, art, health, business……They also have a good selection of kids and teen books to choose from. You can always get a warm drink while you are doing it and we had excellent service to help us find some specific present targets. To top it off, we had our presents nicely wrapped for free by friendly ladies raising money from donations for the Chrohns and Colitus Foundation. Downtown Baltimore and its neighborhood shopping areas should be on your list. The city and the retailers need your patronage. There is also a fun new way to get from place to place without moving your car should you choose. They are the Lime or Bird Scooters that are just one dollar and fifteen cents a minute there after. Pair your shopping with a meal and a nice beverage. You can knock out your holiday present list and turn it into a lot of fun! A month ago, Baltimore got its first bikeshare system, Bmorebikeshare, and ridership is already high. Forty percent of the fleet is made up of electric bikes that make it easier to go up hills, and as the system expands people are likely to want more of those. A bmorebikeshare dock. Photo by author. The City of Baltimore has partnered with Bewegen Technologies to run the system, which cost $2.36 million to set up. Part of the contract includes operations by a company called Corps Logistics. With 22 stations (largely in the flat basin around the harbor) and 175 bikes, Bmorebikeshare has has generated almost 6,000 rides so far. The system is designed to work for both residents and visitors who need to do everything from commute to run errands to just enjoying riding around. I would add that it’s also great for those who want to reach places where parking availability is tight. Phase 1 bikeshare stations (blue dots), Phase 2-spring 2017 (green dots). Photo by author. Beyond being new, Bmorebikeshare stands out because it has North America’s largest fleet of bikes with an electric motor that helps you pedal (a technology known as pedal-assist-technology, or pedelec). I tested the electric bikes on an uphill climb on the newly created Maryland Avenue protected bikeway, and it was amazing how helpful pedelec was. The extra giddy up made for a ton of fun whether on a hill or flat land. Baltimore’s Maryland Avenue protected bikeway. Photo by author. But since Baltimore is a little like a funnel that generally slopes toward the harbor, the boost was particularly helpful when going uphill. The electric bikes will be a prerequisite for many users who seek higher altitude destinations such as Johns Hopkins University or Druid Hill Park or eventually Hampden and Morgan State University. This spring, the system is set to grow to 50 stations with 500 bikes. And since many of the new stations will be uphill from where stations are concentrated now, the pedelecs will be in even more demand. Is expanding the pedelec fleet actually doable? Liz Cornish, Executive Director of Bikemore, Baltimore’s bicycling infrastructure and policy advocacy organization, said at Baltimore Greenway Trail Network meeting the pedal-assist bikes cost $1300 compared to $1000 for the regular bikes. If the bikeshare expanded by another 500 bikes and they were 100% electric-assist, it would only be $150,000 more than an all regular bike purchase. This is not much money if the world of transportation expenditures. Of course, bikes with pedelec may cost more to fix and maintain. But in a hilly city like Baltimore, splurging on the electric bikes to tilt the percentages of the fleet toward the pedelec bikes will likely make sense. The best step forward would be for Bewegen to track which bikes are being used in order to get data on user-preference. If my hunch is true—that more people in Baltimore will travel to more places by bikeshare thanks to the new pedelec bikes—it’d be great to find a way to make sure that’s what’s added to the system. A shot of Baltimore landmarks you can now take bikeshare to. Photo by author. The Red Line might not be happening, but that doesn’t mean Baltimore’s transportation needs have gone anywhere. A plan from 2007 recommends new stations on the MARC’s Penn Line and make it easier to travel to and from Baltimore as well as within the city itself. 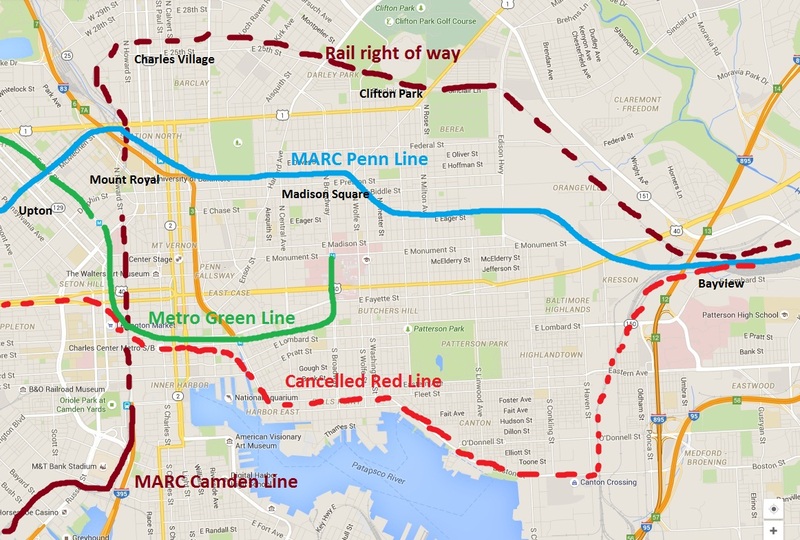 Baltimore’s existing heavy rail lines, along with potential MARC stops and the now cancelled Red Line route. The 2007 Plan also discusses possibilities for expanding the Camden Line. Base image from Google Maps. Assembled by the Maryland Transit Administration, the 2007 MARC Growth & Investment Plan featured a number of rail projects, many of which would invest heavily in Baltimore. Adding more MARC stations to Baltimore would also amount to intracity service, removing some of the sting of losing the Red Line investment. A 2013 draft update omits stations and improvements planned for the city. There isn’t an explanation for why. The plan includes three new stations on the Penn Line, which runs from DC Washington’s Union to Station to Perryville, Maryland, near the Delaware border. 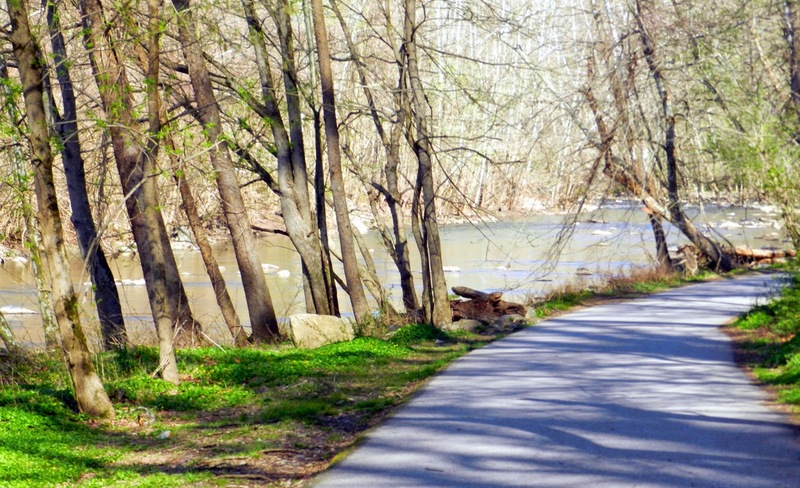 1.The first is Bayview, near the Baltimore City/County line. Bayview would be a strong choice for a transportation investment because has easy access to Interstates 95 and 895 and park & ride opportunities, a major hospital, and dense neighborhoods nearby. Bayview is also easy drive from large suburbs in Baltimore County such as Essex and Middle River. Bayview was meant to have a connection to the Red Line and has considerable station planning work was completed on the $60 million project. Of all the proposed new stations, this one is the most shovel ready. 2. The second is Madison Square, in the center of East Baltimore. 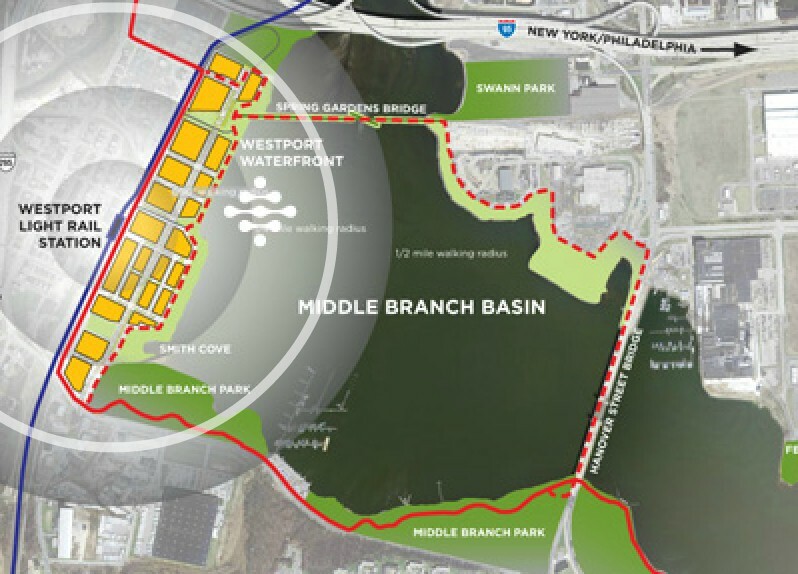 The 2007 plan specifically calls for proposes a connection to the Metro Green Line and Johns Hopkins Hospital, which is one of the region’s largest job centers. A stop here would provide regional rail access to Northeast Baltimore, an area currently unconnected to any passenger rail network. 3.Finally, the plan proposes a station at Upton in West Baltimore, with a proposed connection to the Metro Green Line. This proposed stop is near the epicenter of the 2015 riots. Completing this connection would require making a station that links connection between the subway and the train tunnels that pass over each other. Work on the B&P Tunnel is being planned now. Riders leaving the MARC at Baltimore’s Penn Stations. 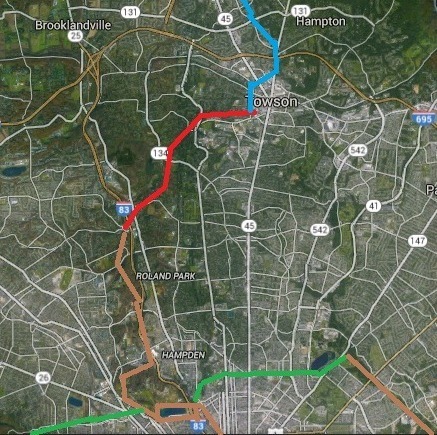 Would more stations on the Penn Line help transit in the city? Photo by Elvert Barnes on Flickr. The MARC lines are regional in scope, but by adding stations in dense populated neighborhoods outside of downtown on both sides of the city, Baltimoreans would have more access to the line. Those coming into Baltimore, will also have much greater choice of places to get off that might be closer to their destinations. When it was still on the table, a lot of people called the Red Line the “jobs line” because it would have connected so many of Baltimore’s densest employment clusters, especially near the harbor and in Baltimore County. The MARC Penn Line runs about three miles north of the Red Line alignment, and while the proposed stations are in places with fewer jobs, they’re still close to large residential populations. That means new Penn Line stations could very well attract new jobs in the future. Like the Red Line, the MARC lines cross from west to east (although the Red Line was to go much further west into Baltimore County). Adding stations on the Penn Line at Bayview and Madison Square in particular, appear to be feasible. With multiple new stations within Baltimore and more frequency, it could create “transit-like” service through Baltimore. If that were to happen, it would be an economic jolt for neighborhoods in the city’s interior. As the state and city discuss transportation improvements for Baltimore, the 2007 MARC Investment Plan for Baltimore should be on the table. Adding MARC service and stations in Baltimore is not a substitute for the Red Line, but it would do a lot of good in different areas of the city. Without the Red Line: what is next for Baltimore transportation? Most Baltimoreans concerned with the Red Line thought the rail project was finished when the election returns came in last November. The Red Line was an O’Malley project, and when his Lieutenant Governor was beaten to a highway man, what other conclusion could be drawn? Surprisingly, the new Governor promised to study the rail project and he kept spending money on it. The Baltimore business community became more vocal in support of the Red Line and the Governor’s team met with project advocates. False hope creeped in for supporters for the next eight months, before the Governor did what we expected him to do all along and kill the project. The new question is, does Baltimore get a consolation prize? If so, the most befitting of Hogan’s rhetoric, would be a pledge to help pave Baltimore’s craterscape of a road network. This would make many people happy, but would do almost nothing to help people connect to jobs or alleviate congestion. There are several very-helpful piecemeal projects the Governor should consider, but he would have to be open minded to some transit-oriented solutions. 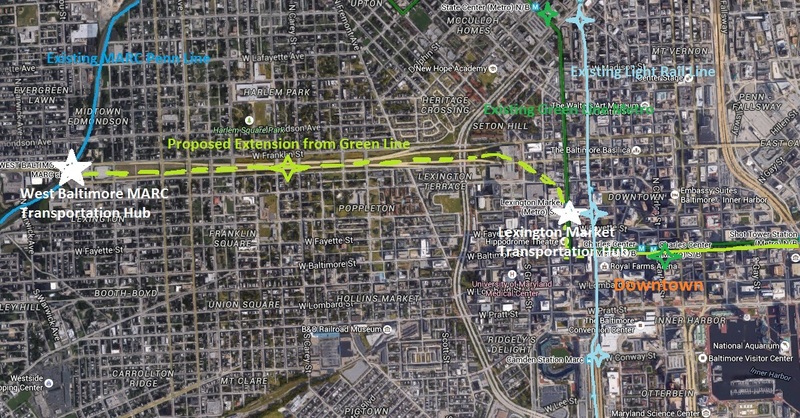 Critics of the Red Line alignment, including the Governor, most often point to the proposed parallel tunnel. Here are few ideas to contribute to the discussion, none of which include a duplicate tunnel. West Baltimore needs jobs and better transportation connections. What better place to focus than a Washington connecting MARC Station with lots of available land for future development. 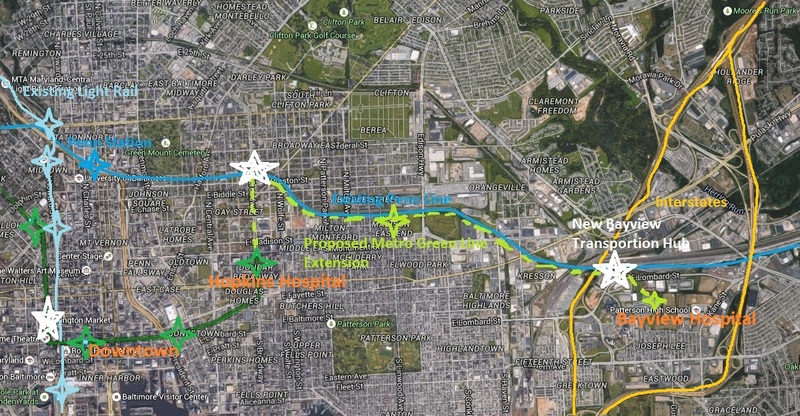 To make it viable, build a short speedy two mile metro branch from the West Baltimore MARC station that feeds into the green line at Lexington Market. The train can travel above ground with dedicated right-of-way in the former “highway to no-where” before descending into the existing subway right-of-way. This should keep expenses within Hogan’s fiscal sensibilities. High-frequency buses can feed into the MARC station from all over West Baltimore including social security. 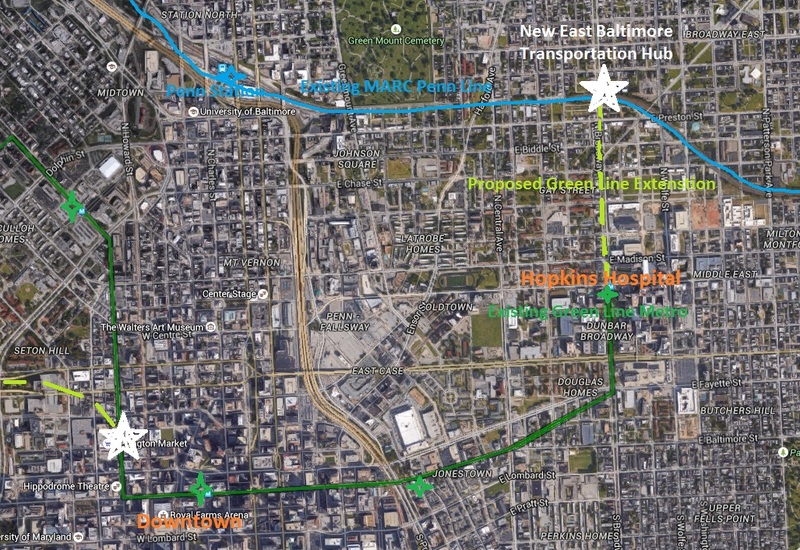 This short rail extension would link the center of West Baltimore, MARC and bus riders, with a speedy rail connection into downtown and beyond. While closer to jobs in Southeast Baltimore, East Baltimore has a similar economic malaise as West Baltimore. 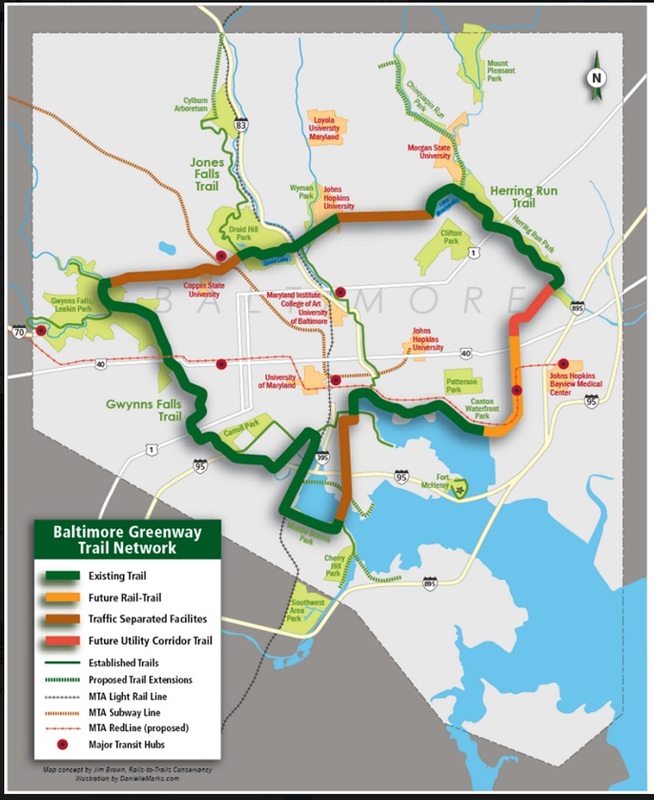 Extending the existing Metro Green Line just a half mile to the MARC train tracks and building a connecting station would drastically help east Baltimoreans reach jobs in downtown Baltimore as well as those that can be accessed by the MARC Penn Line. This new hub would drastically reduce the isolation of this part of the city. 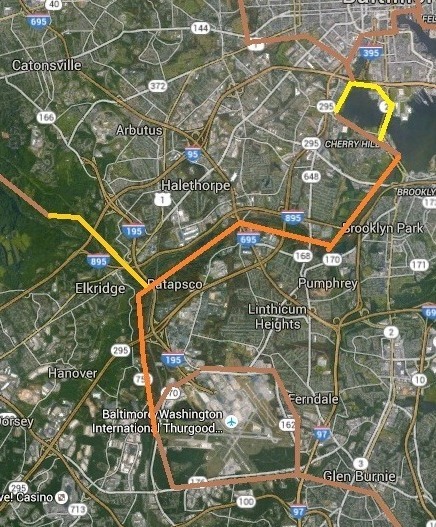 After the green line is extended north to the MARC train in east Baltimore, it can make an easterly turn above ground along the MARC right of way four miles to a new Bay View MARC Station. While also serving the hospital, a station here could also create a great park & ride option for drivers on 95 and 895. This should help ease downtown congestion if drivers can park here and take a swift metro ride into: downtown, the Johns Hopkins Medical Complex, or other green line or MARC train destinations. A new high level of service 6.5 mile bus line linking the jobs, dense neighborhoods, shopping, and entertainment along the bustling southeast harbor coast with endpoints of Lexington Market and Bayview would very helpful. This line is where a lot of jobs are. With tunneling off the table and no clear right-of way available needed for a practicable streetcar, major bus improvements appear to be the next best option here. While many more ideas will surface, these four transportation enhancements would bring significant benefits to Baltimore, involve little tunneling, could be phased, and are fiscally restrained. Adding four new station hubs where rail lines would connect, while avoiding the expense of any new underground stations, might appeal to the Hogan administration. Baltimore needs and deserves major transit improvements. Governor Hogan, does Baltimore get anything?